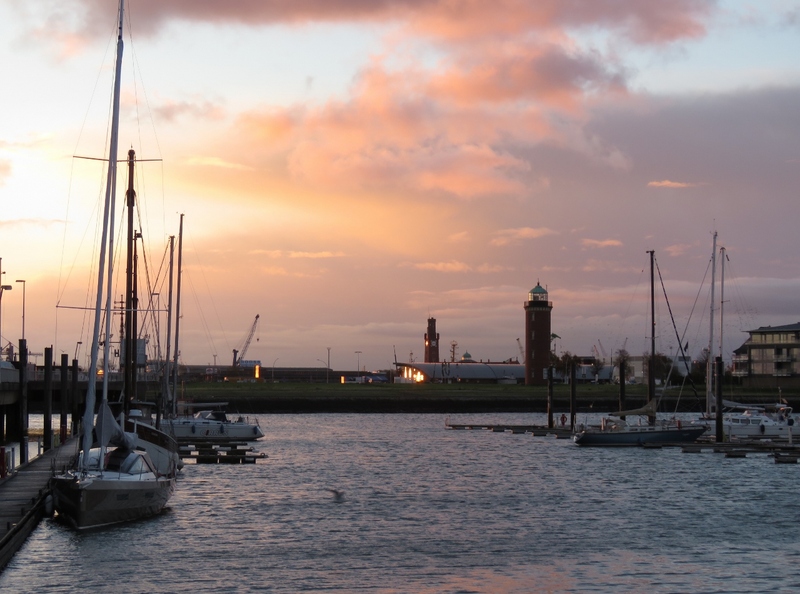 On our run from Germany to the Netherlands, we’d hoped to exit the German Bight on the border at Delfzjil and take the sheltered Netherlands canals through Leeuwarden to Harlingen. But the least depth through some of the waterways is an optimistic 1.9m, too shallow for our 2.1m draft. 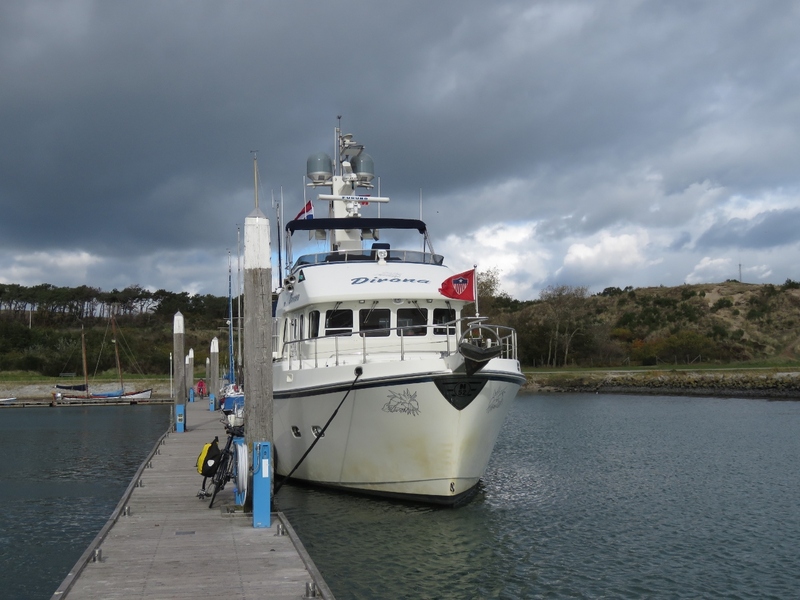 So we instead returned to the Netherlands at the Vliestroom channel, where we’d exited six months earlier en route to Norway, and made landfall at West Terschelling. 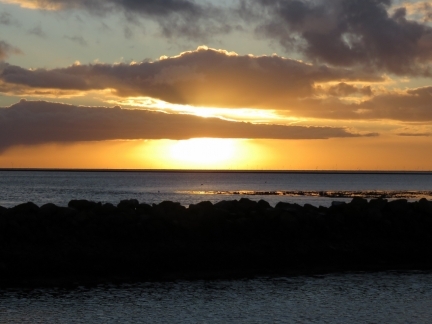 This passage is not a popular one for Dutch sailors returning home at the end of the summer season, as conditions in the German Bight often are rough. We ran north for several hours into head seas on the Elbe River before turning southwest and trading 14° of pitch for a more tolerable 14° of roll that eventually lessened to around 10°. 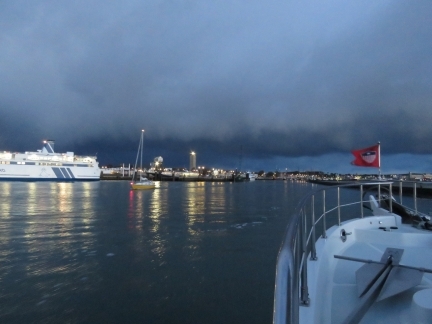 As expected, we have a weather window this morning to make the overnight, 160-mile run from Cuxhaven to The Netherlands. It’s not quite as nice a window as initially predicted, but the forecast looks substantially worse into next week, so we’ll take this one. We’ll need to exit Cuxhaven and run up the River Elbe into 15-20kt northerly winds blowing against an ebbing current. Conditions likely will be rough for the first couple of hours, but should settle down as we turn southwest and the winds turn more to the northeast. The winds should be behind us from for the remainder of the run, although will pick up into the high 20s as we approach West Terschelling around 7am tomorrow morning. An 8:30am sunrise shortly before we depart Cuxhaven, Germany for the Netherlands. We’ve been underway for about an hour and are just abeam of Neuwerk. 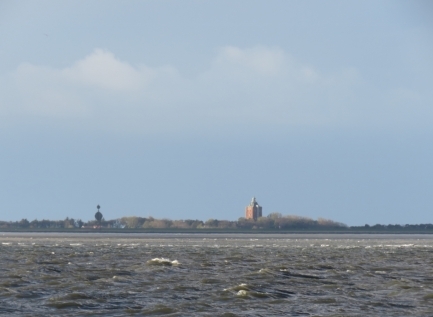 At low tide you can walk 4 miles across the tidal flats to reach the island from the German mainland coast. 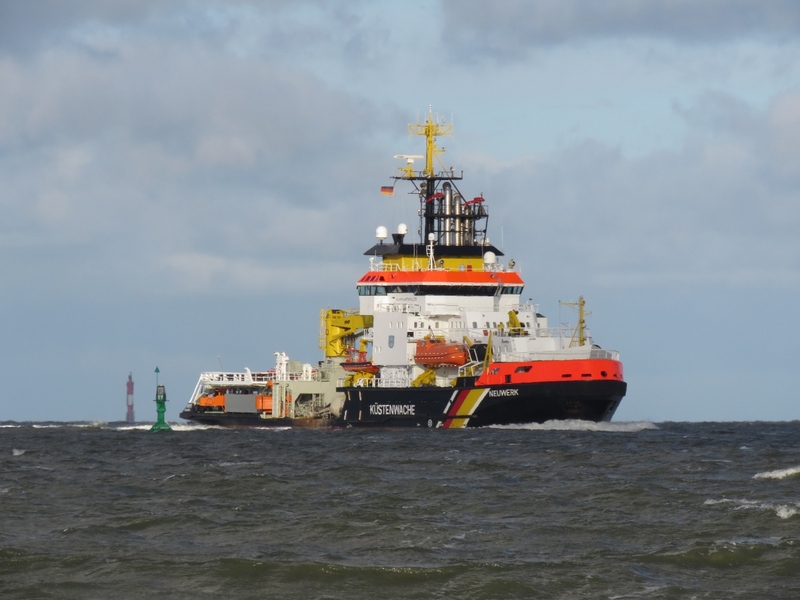 Passing the 260ft (79m) German Coast Guard vessel Neuwerk that we saw earlier at Cuxhaven. 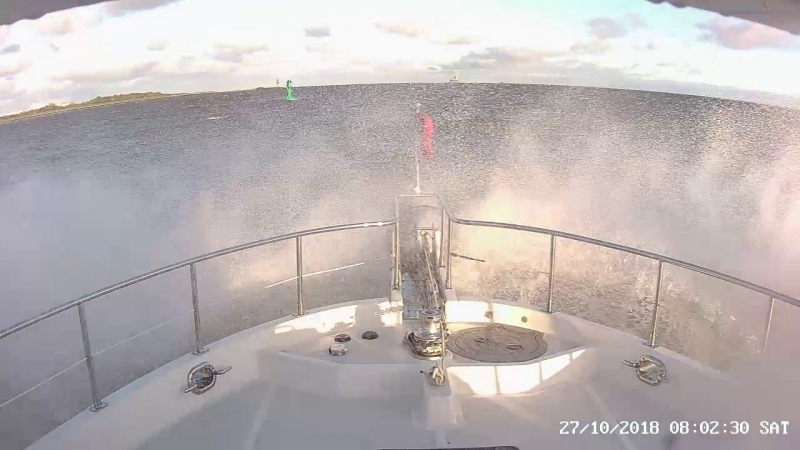 As expected, we’re running into head seas as we exit the River Elbe in a several-knot current against 15-20 kt winds. We’re running just outside the busy Elbe River vessel traffic lanes. We expected the seas to be against us for the first part of the trip and they are, with a maximum pitch over the past five minutes of 14.4°. We’re aiming to arrive in the Netherlands just past daybreak, so rather than working hard to force through the conditions and arrive earlier, we maintained RPM and let the speed fall. Conditions should improve as we get on a more southwesterly course. The pilot ship Duhnen at Elbe estuary, with the larger pilot base vessel Elbe in the background. 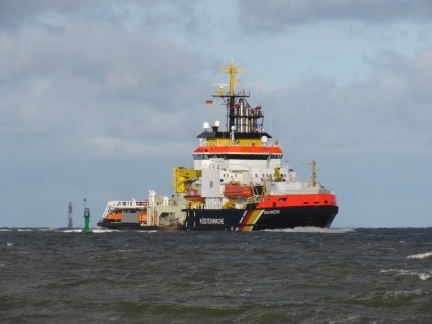 The Elbe has accommodation for 34 crew and 50 pilots—most Elbe river pilots start their assignments here. Conditions have improved markedly as we turned southeast. The maximum pitch over the past five minutes is down to 4.6° from 14.4°. With the waves more on our beam we are rolling a fair bit at 14.2°, but that is a much more tolerable motion than a similar degree of pitch. 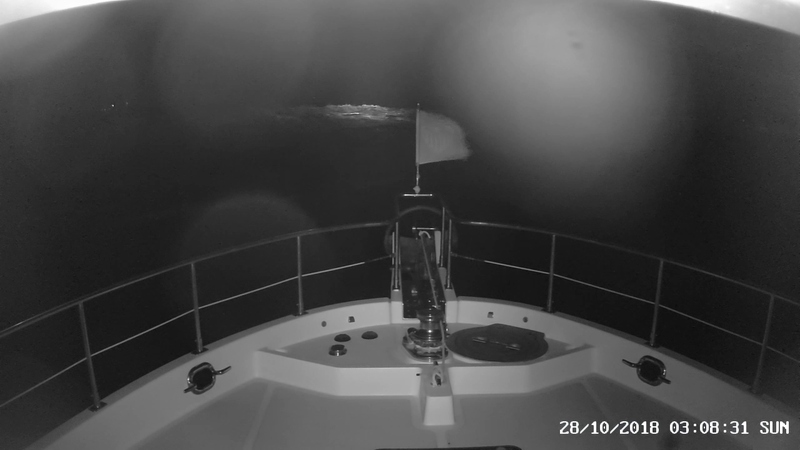 The tide has turned against us, so we’re only making 5.7kts, but that also should improve as we pull away from the Elbe estuary. 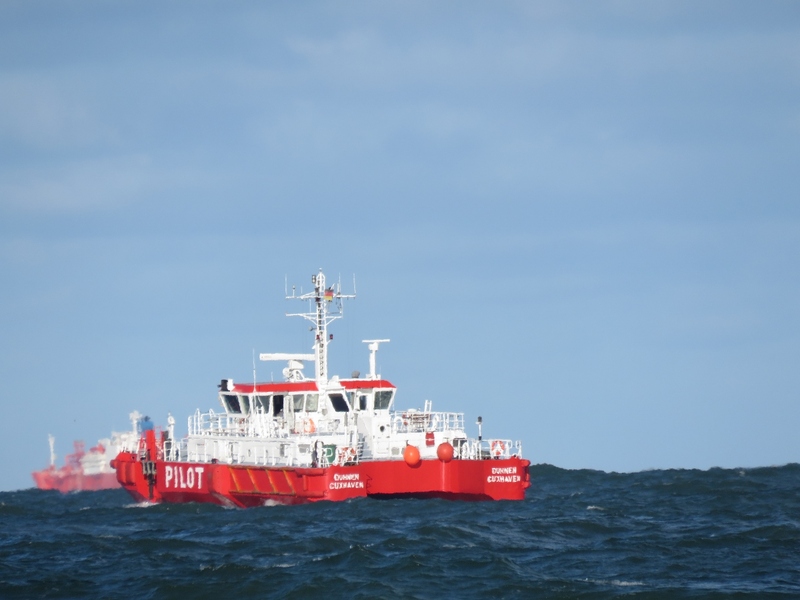 Our initial plan was to enter the Het Vlie following the same path we’d exited en-route from Harlingen to Norway earlier this year, taking a short-cut across a narrow bar with depths of 40ft (12m). But as we neared in the dark, we could see a solid line of breakers ahead of us, so opted for the slightly longer route through the main channel entry. This is a beautiful example of where the forward spotlight really does add a degree of safety. It’s difficult to see breaking waves on a river bar when you’re on the sea side of the waves. 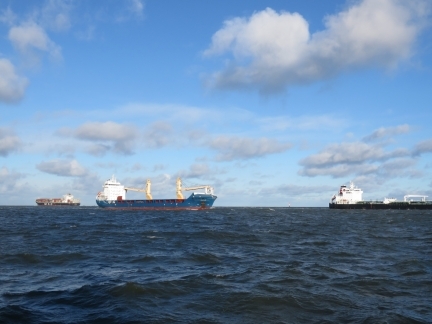 Entering the channel along the West-Terschelling waterfront with a car ferry to Harlingen on the left. 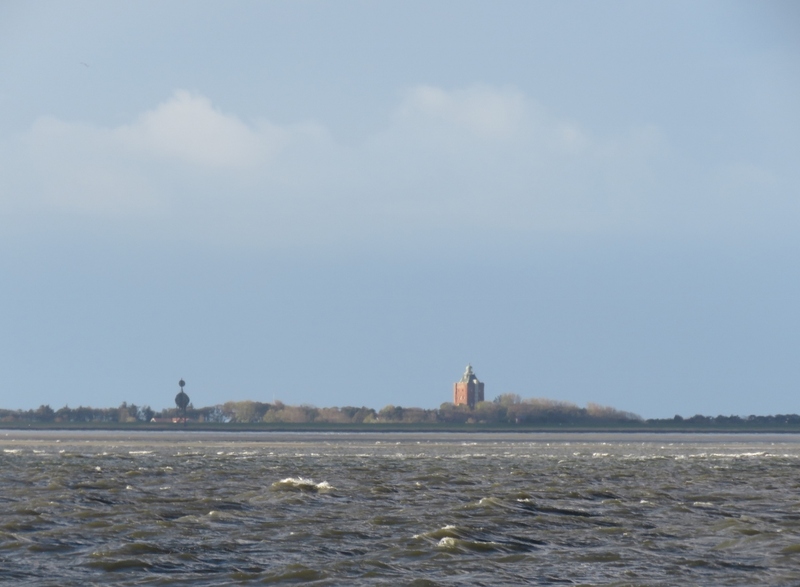 Prominent in the backround is the oldest lighthouse in the Netherlands, the Brandaris, built in 1594. We could see the light from the 180ft (55m) tower for miles as we neared landfall. We passed a constant stream of boats exiting as we followed the channel towards West-Terschelling, and the marina was completely packed with vessels rafted three-deep. We were a little surprised as only a few boats were in the harbour when we’d looked on their web cam Friday morning before leaving Cuxhaven. 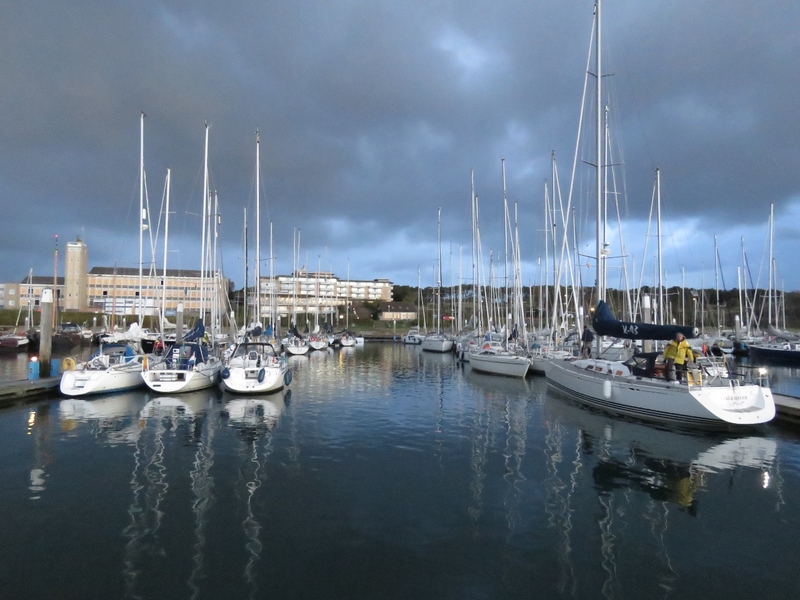 A regatta of 117 had since arrived, and many were in the process of departing as we neared. 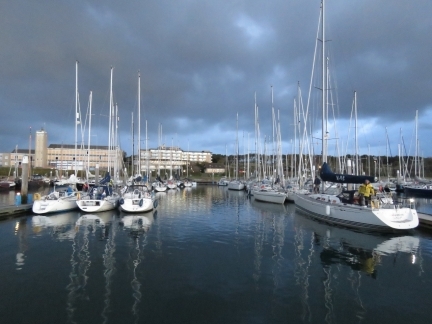 By late Sunday afternoon, the marina was empty again. Sunrise viewed from our berth at West-Terschelling. Dirona moored at the West-Terschelling marina. You can see we have quite the brown “Kiel Canal moustache”.